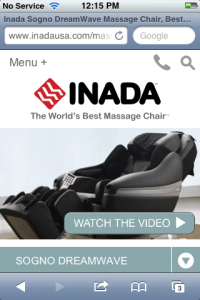 The Creative Alliance continues to help clients leverage responsive web design (RWD), this time for client Inada USA, the exclusive U.S. distributor of The World’s Best Massage Chair™. The site, at www.inadausa.com, is optimized for mobile, eliminating the tedious “expand and pinch” technique so common on sites without RWD. With RWD, users can access inadausa.com on a variety of mobile devices, including smartphones and tablets. The content is adjusted based on the device that is accessing the site and users are able to see the full site rather than an abbreviated version. For smartphones, the site uses a custom, specific menu system that has been developed to make navigation easy on a smaller screen. 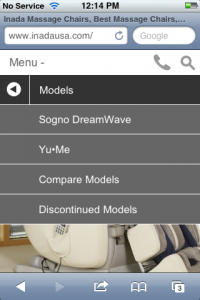 Because space is at a premium on mobile devices, inadausa.com takes advantage of smaller menus and submenu systems to make it easy for users to navigate.